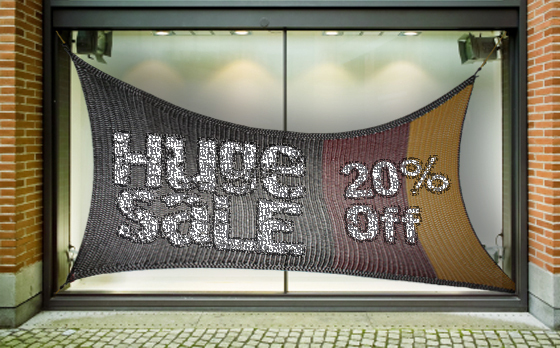 Signs.com is proud to present our latest offering: hand-knitted banners and yard signs. Studies show that customers prefer businesses who offer a personal touch. You can convey a sense of warm, cuddly customer service with these custom yarn signs. We offer an array of colors and yarn types to suit any kind of business. A recent Pineview Elementary study showed that customers prefer signage that is soft to the touch. Dr. Perl writes, “Overwhelmingly, people gravitate toward signs done in cashmere or angora. In a blind study along a busy highway, we found that folks actually stopped their cars, got out and stroked the cashmere and angora signs, for an average of 4.3 minutes. Other fibers, such as wool and cotton were less popular.” If your business is situated in a location that allows for petting, a soft-fiber yarn is preferable. Signs.com offers cashmere, angora and silk. For budget-conscious consumers, an Egyptian cotton yarn is available. If your sign will be exposed to adverse weather conditions, a wool or dacron yarn is preferable. Wool in particular holds up in even very cold climates (there’s good reason that polar explorers prefer wool socks). Signs.com has many options for our eco-conscious consumers. We offer yarns made from bamboo, hemp, raffia, soy and coconut husk. You can rest assured knowing that the materials in your signage are not depleting the planet’s resources; all our green-friendly yarn is certified organic and was inspected by a special task force put into place by former Vice President Al Gore. The colors used on your knitted sign are very important. We address color combinations in our previous post, Effectively Using Design Elements. The most legible combinations are black on yellow, black on white and yellow on black, though many find that knitted designs in these colors come out looking like bumble bee-themed pot holders. You may prefer blue and white, or green and white, which have also been found to be effective combinations. 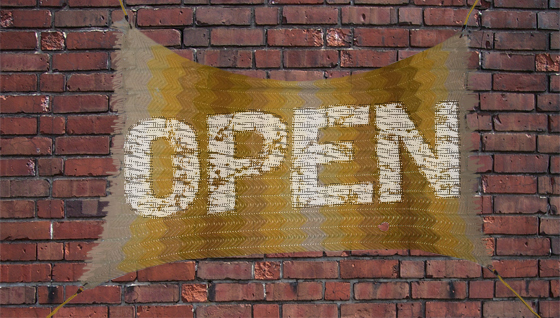 For a small additional cost, you can design your sign using variegated yarn. Heather and tweed yarns add a formal touch to signage for businesses offering products such as men’s suits and office supplies. Bright variegated yarns in yellow, red and blue are perfect for party supply stores or pizzerias. Pastels variegates are the yarn of choice for maternity shops, infant apparel and nursery furniture stores. Some of our customers have asked for natural dyes in lieu of the standard, artificial dyes found in many yarns. Always alert to customer preferences, Signs.com offers a line of naturally dyed yarns. Dyes originate from roots, berries, bark and leaves. Colors will mellow a bit with age, much like a fine wine. All hand-knitted signs are designed and manufactured in the United States. Signs.com has collaborated with numerous knitting clubs across the country to provide top-quality, custom signage. We also have contracts with retirement communities and the American Association of Librarians. Recently, knitting has become popular with college students. Signs.com offers three internships per semester to students who may earn valuable business experience and college credits by knitting hand-made banners. In addition to hand-knitted banners and yard signs, Signs.com will offer additional knitted products to give your business a cohesive feel. Custom sweater-vests for employee uniforms can be ordered in yarns and colors to match your banners. Restaurants will enjoy our hand-knitted wine bottle sweaters and tea cozies. You might consider water bottle covers in matching yarns so that employees can stay hydrated while still matching the overall theme of the store design. Due to the additional time required to manufacture hand-knitted signs, we regret that we are unable to offer a three-day turnaround on orders for these products. We anticipate great interest, so place your order today.